Life with Giggles: I hate my can opener! So, I decided to make myself a tuna sandwich today for dinner, since Mr. had saved his cheese steak sandwich that we got from Pat's this weekend. 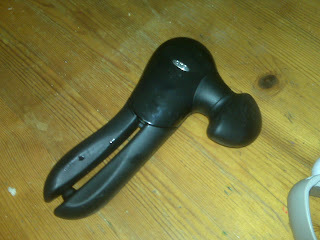 Before we were married, the Mr. bought a handy dandy gizmo that was a one touch can opener. The idea is that you put the can opener over what you are opening, press the button and then it's suppose to squeeze together until it fits snug over the can then turn it automatically while cutting. Below is a picture of the can opener. 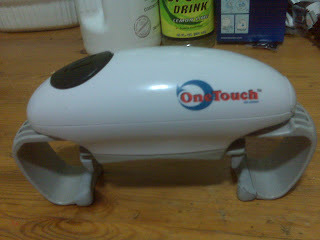 It's called OneTouch. 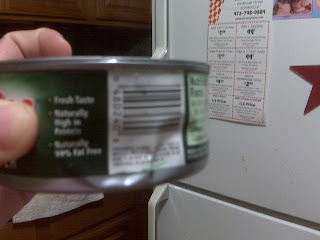 Now, that handy dandy gizmo of a can opener did this to my tuna can, AFTER we heard a huge POP noise! 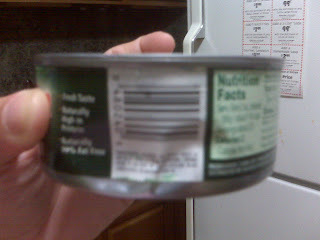 Another picture so you can really get the idea of the strength of the stupid can opener. 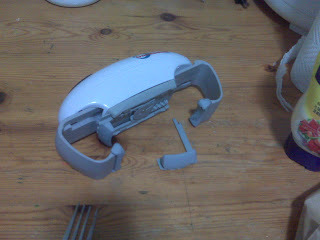 And, now a picture of the broken piece of the stupid can opener. And a picture of my favorite gadget in the kitchen (for today), my wonderful Oxo manual can opener that is very easy to turn and cuts without leaving edges. Oh yeah, and it was my FIRST time using this stupid can opener! Haha, I always attract can opener troubles!